Welcome to A10 Talk’s Preseason Top 25 Player Countdown for the 2017-18 season. Each day, we’ll be publishing a new article, counting down our best 25 players for the coming season. Today, we feature #18 Josh Cunningham of Dayton. Grant Labedz (@GrantLabedz), Mat Shelton-Eide (@MatSheltonEide), Grant Kelly (@GrantKelly07), Andrew Phung (@LoveRI401), By George (@ByGeorgeGMU), Davidson Recruiting (@DavidsonMBBRecr), Steve DiMiceli (@SteveDiMiceli), Rhody Rampage (@RhodyRampage), UMass Recruiting (@UMassRecruiting), Bona Blog (@BonaBlog), Petey Buckets (@PeteyBuckets), and UMass Ball Report (@theumbr). Coming out of high school as a top 100 recruit in the nation, Josh Cunningham originally committed to Bradley University. At the end of his freshman season, however, Cunningham decided to transfer. After sitting out during his redshirt year, the 6’7″ forward saw his first action as a Dayton Flyer last season. Cunningham started off the 2016-17 campaign strong, but unfortunately saw it cut short due to injury. The redshirt sophomore threw down a monstrous dunk to seal a win at Alabama in Dayton’s second game of the season. As he came down, though, Cunningham suffered a gruesome ankle injury. Even though Cunningham’s injury did not turn out to be as bad as it could have been, it still sidelined him until February. Once Cunningham did return from injury, his game action was limited. Only three times did Cunningham play 20 plus minutes and only twice did he score in double figures the rest of the year. On February 14th, Cunningham scored 12 points in Dayton’s Arch Baron Cup win at Saint Louis. Then on March 1st he dropped 10 points and pulled down four rebounds to help the Flyers secure a win over VCU and A-10 regular season title. While Cunningham’s numbers in 2016-17 were thrown off due to injury, he did impress when at full strength. Scoring in double digits in each of Dayton’s first two games, Cunningham gave Flyer fans a look at his potential when he’s fully healthy. Trying to fill the role of standout Flyer forward Kendall Pollard who graduated in the spring, Josh Cunningham will look to have himself a breakout season. While Cunningham has looked good at times, injuries have held him back to this point in his career. Finally 100% healthy, Cunningham could easily be one of the Atlantic 10’s top players in 2017-18. The best is yet to come in Cunningham’s career and all signs point to him putting breaking out as a lethal big man this season. 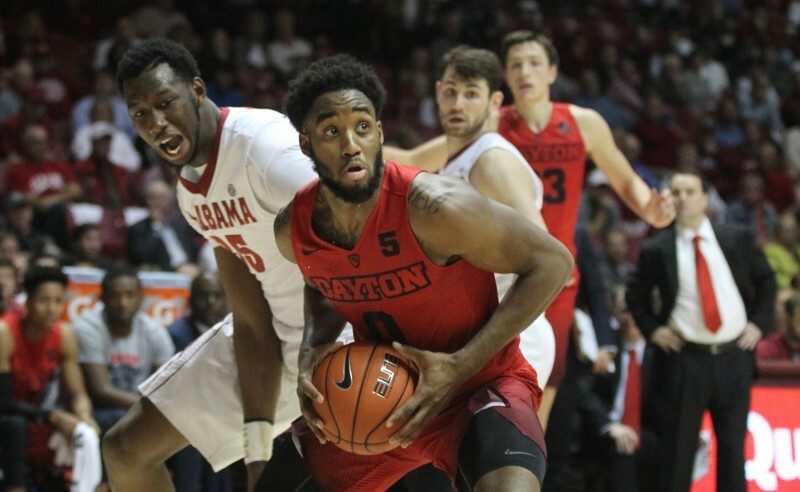 Alongside fellow junior forward Xeyrius Williams, Cunningham could turn out to be not only Dayton’s best big man, but Dayton’s best player this season. Already named a captain, it’s clearly Cunningham’s time to take control on the court and lead the team. Expect the 6’7″ forward to put up double-double type numbers every game this season. If Cunningham plays to his strengths with tough buckets inside and strong rebounding, he could quickly become a standout player in the A-10. Follow us on Twitter, like us on Facebook, and check out our forum for more Dayton content.